Sarah is a writer in her forties. She lives by herself in an inner Melbourne apartment, which she rents privately. With a tertiary degree and regular work, Sarah had always been able to manage her finances; but things changed after she was held up in an armed robbery, and later assaulted. She developed post-traumatic stress disorder (PTSD), anxiety and depression. Suffering regular panic attacks and agoraphobia, she stopped working and fell behind on bills. With about $350 owing to AGL for electricity, Sarah applied for a utility relief grant. The grant reduced her debt to about $150, and she paid a further $25 up front. She was left with no money and began receiving calls and letters from AGL, which she did not answer. Essentially I just put my head in the sand. I didn’t know what to do; I didn’t have the means to rectify it. I had received a registered post letter from [AGL] before the energy was disconnected. I didn’t open it because I knew what it would be about. Sarah accepts responsibility for not responding, but feels AGL could have handled things better. Given that they knew my situation and in the end I only owed $220.00… I just wonder whether there are better ways to go about addressing these issues than just cutting someone’s power off. Sarah says AGL’s approach was distressing, and compounded her mental health issues. 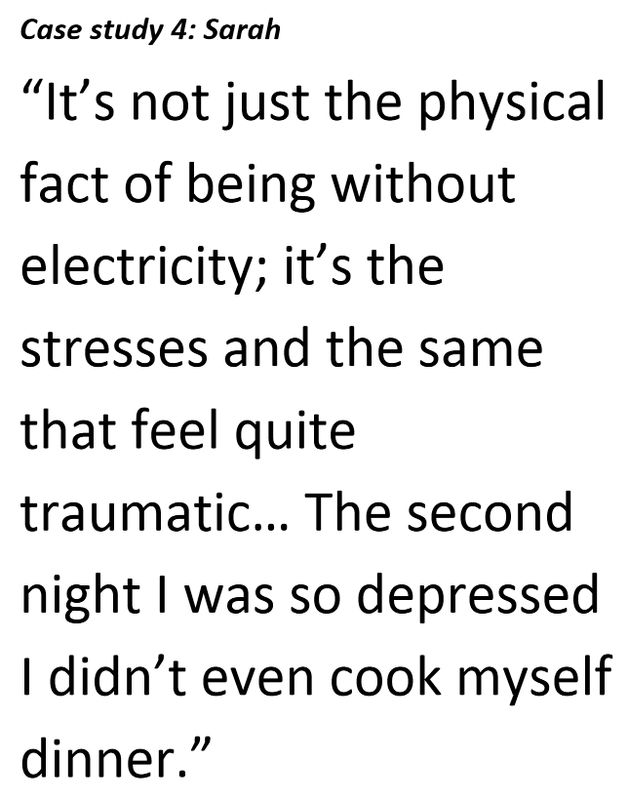 Eventually Sarah’s electricity was disconnected for two and a half days in March 2015. Sarah stayed at home and did not tell anybody what was happening. I found myself unable to even reach out [to] people in my social circles to ask if I could come over for dinner, because I would have had to explain that my electricity had been disconnected… I felt quite alone with the problem… I hadn’t even told my boyfriend. With no money for takeaway and food going off in the fridge, Sarah initially tried to make do with what she had. But her situation quickly brought her down. After two days Sarah contacted MoneyHelp. On their advice she called EWOV, who negotiated with AGL to have her electricity reconnected within the hour. When that happened I just burst into tears… I felt like I’d lost a sense of my own agency to negotiate with the power company, because their methods of communication had become so aggressive and so inhuman. Sarah found out about MoneyHelp and the Utility Relief Grants Scheme through her jobseeker network. AGL did not refer her to them, and she thinks many people would be unaware of them. I think people can get into a situation where they feel so desperate that they don’t really believe they can get help… the first day I was disconnected I felt powerless. I didn’t have the courage to call the electricity company and I didn’t know who to go to… Certainly I wasn’t thinking, ‘oh yeah, I’ll just call the Ombudsman’. Sarah feels she is recovering from PTSD and hopes to find work soon. I don’t want to be long term unemployed… My goal is to be able to return to a functioning, abundant, resourceful life, and contribute my skills to society. In the meantime, after rent and bills, Sarah lives on $216 per month. She still owes $210 to AGL and worries she could be disconnected again. Sarah thinks retailers could play a more supportive role for customers in hardship. There [could] be some sort of advocacy team [where] you are assigned one person to deal with [who] forms a kind of a professional relationship with you, to help understand your situation and to come up with a plan.